And a little closer to home! Having been a fan of lighthouses for many years, but never having been to any events or lighthouse locations specifically for International Lighthouse and Lightship Weekend (the third weekend in August), we decided it was about time I did! On my tour I’d stopped at Noss Head Lighthouse, just to the north of Wick (so not quite so far from home this time), but Bob had informed me since that there was an exhibition relating to the old optic at Wick Heritage Centre. So, taking advantage of the fact that it was that particular weekend, we set off to visit the Centre. Rather than going straight there we took a small detour and stopped off for lunch at the Whaligoe Steps Café, just a short distance down the road from Wick. They serve some fantastic soup there and I’ve not yet managed to encourage myself to try anything else there as I enjoy the soup (and homemade bread) so much. Arriving at the Heritage Centre, we were given a short introductory walk around and while the staff member strolled on through the lighthouse exhibition saying only ‘This is the lighthouse exhibition’, we made a mental note of where our first stop would be. 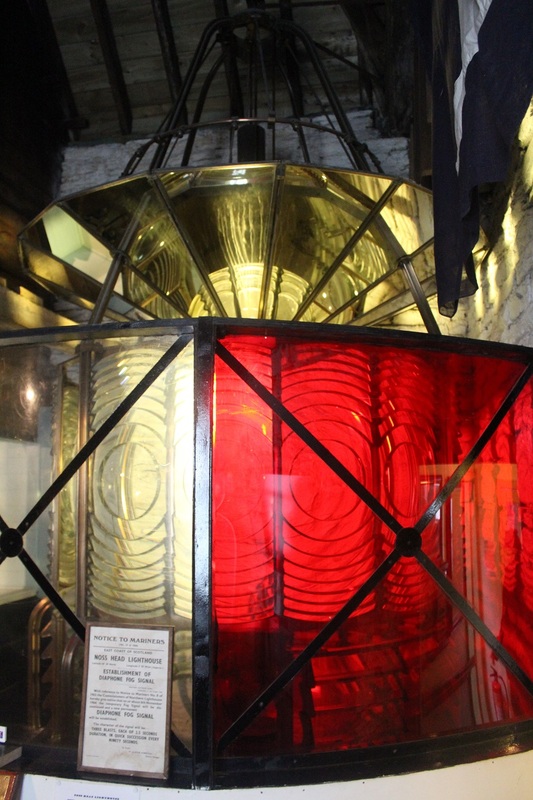 The story behind the lighthouse optic now being at Wick Heritage Centre is that when the lighthouse was de-manned and automated in 1981, the plan was to just scrap the old optic and replace it with new technology. Fortunately Maisie Sutherland, a founder member of the Wick Society, stepped in and organised for the optic to be delivered to and displayed inside the Heritage Centre. So, we have Maisie to thank for allowing many people to continue to enjoy the optic and (I suppose for many), it is the only chance they will get to see what the Fresnel lens looks like close up. They’ve got lots of other lighthouse and maritime memorabilia there too and it’s great that it’s being preserved. 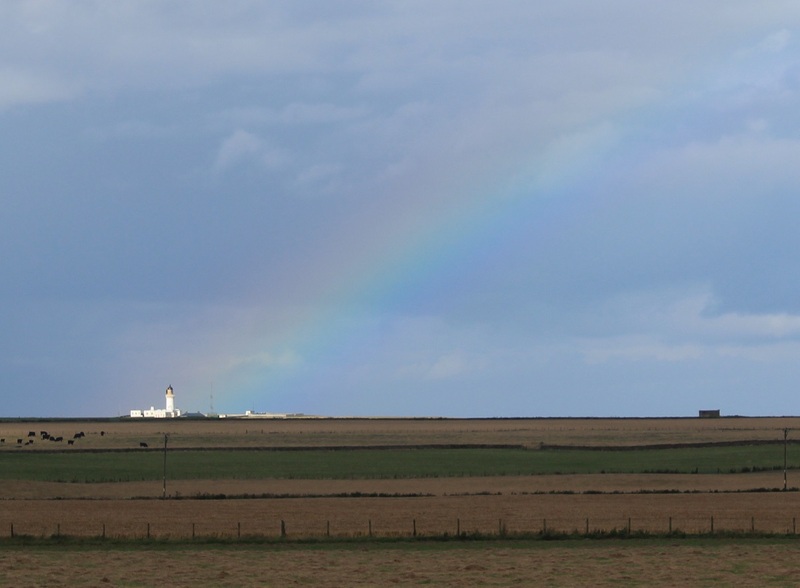 From the Heritage Centre we drove north to see Noss Head lighthouse itself. On the way we stopped for tea and cake at Rivendell’s Rumblin Tum Café, which was a great little place we’d never discovered before. The owner not only runs the café, but also makes some fantastic wooden carvings and can do personalised carvings too. A wonderful little discovery for us! At Noss Head we weren’t able to get close to the lighthouse itself, but could see it from the car park. It was looking lovely in the sunshine when we arrived. We decided to take the opportunity to stroll along to Castle Sinclair Girnigoe while we were in the area. We’d spotted it a number of times from the road, but never been close so it seemed like the perfect opportunity. Some areas of the castle have been cordoned off, clearly for safety reasons, and it does look like work had begun at some point to maintain it, but much of it is now in ruin and there’s no sign of a roof anymore. Still a really interesting place to look around and the cliffs surrounding it are stunning.